So, it's 9PM and I realize that I have no POTD, not even one picture taken today. Can you believe it? As the kids were about to get ready for bed Haldan suggested I photograph them brushing their teeth, which is a big deal in this house. As in... they won't do it. What is it with kids and brushing their teeth? I even got Pokey the one that sings some Hannah Montana song as she brushes and Little Man has an expensive electric one (Oral B Triumph) that does most of the work for him. I know I've explained the reasons for it dozens of times (and it seems like more). It just doesn't sink in or maybe it's sheer laziness. Can't figure it out. The other morning Pokey came in my room and I sent her to go brush her teeth. She asked why she had to brush AGAIN. I simply told her not only would she look funny without teeth, but that she wouldn't be able to chew her food very well. She said, "You mean you have to PURE it?" And I corrected her, "you mean puree it?" "Yeah, " was the response. They've heard the stories over and over about how they didn't get their bottom front teeth until they were at least 2 years (both of them), so I had to puree their food. Little Man actually got the last of the 4 bottom front teeth (I think a lateral incisor) at the age of 3. Both of them got their back molars first; at about 14-15 months they cut the first one. They never followed any rules in any book and had several dentists mystified, but they eventually got them all. Pokey had a friend from school over about a month ago now and I couldn't help but notice her teeth were black and rotten. I try not to be judgmental, but I felt so bad for her. These were her permanent teeth and how could a parent allow that to happen. My kids may not always have the squeakiest teeth; they may even be a little furry at times... but I would NEVER let it get to that point. EVER! 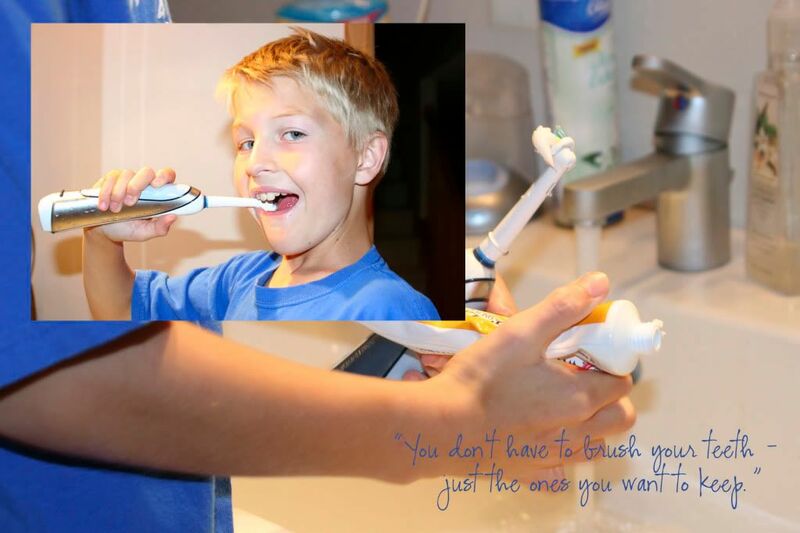 Mostly that we don't brush enough, but that brushing the wrong way can be damaging too. There are also certain foods that you wouldn't think would be bad for your teeth, but they are. Things such as bread, crackers, milk, juice, fruits, and many more. Baby bottle syndrome comes to mind with this one. If you can't brush right away after eating, rinse it down with some water. It inhibits the growth of bacteria that contributes towards gingivitis or tooth decay. If you eat your carbs and protein together, have the protein last. Some people have better bacteria in their mouth than other people and actually don't need to brush as often. Doesn't seem fair, but it's true. If you let the tartar (or plaque) build up it becomes calcified (calculus) and only a professional can remove it once it has reached that level. That's why we need to brush daily and have regular cleanings. The calculus can lead to gingivitis, tooth decay, or periodontal disease. Gingivitis is reversible if daily brushings of teeth and gums are re-introduced. We have salivary glands near our upper back molars and behind our lower front teeth that contribute towards the calculus build up in those regions. There are many systemic diseases which have been linked with the bad bacteria in our mouths. Diabetes, heart disease, and pre-term pregnancy are some of them. Our mouths are so very complex. It's just hard for a child to fully comprehend. I guess that's why as parents we need to be vigilant with our efforts, even if we feel like we're not getting through. Alicia, I like the picture of the day. Can you recommend a good dentist? Mike and I are in dire need of one but, I am so afraid of going to a bad one we just haven't gone. Who do you use for your kids? I have been using one in Iowa City but, would like to find one local.